Much like VHS tapes overtook Betamax rendering the platform obsolete, a similar head-to-head match brews in the arena of rifle accessory rails. While Picatinny rails have existed for years on the AR-15 platform, the mounting system is often bulky and heavy. 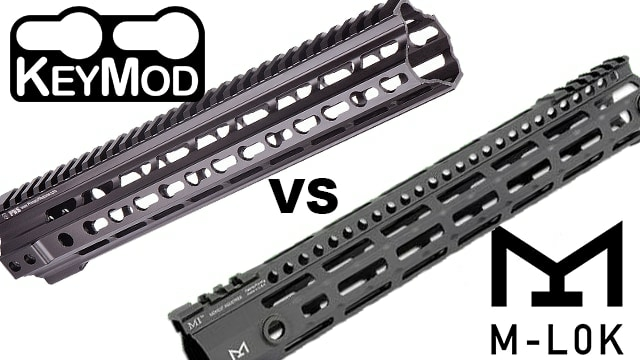 Seeking to alleviate excess bulk, two contenders emerged offering handguards that allow accessories to attach directly to the handguard without the need for additional rails; thus, the epic battle of KeyMod vs M-LOK was waged. KeyMod and M-LOK both offer a direct attachment method that permits lasers, lights, bi-pods and other accessories to hard mount to a negative space mounting point, however, the two options differ slightly in the means of attachment. KeyMod rails consist of rows of keyhole shapes that allow KeyMod-compatible accessories to mount into place on the handguard. To attach an accessory, users line up the lugs on the part with the round part of the keyhole then slide it forward and tighten the screws. The result of a partnership between VLTOR and Noveske, the open-source KeyMod design was released to the public domain in 2012. The open source designation allows any company to make rails or accessories using KeyMod without paying royalties. The open source nature encourages gear makers to use the lightweight system when designing handguards, accessories and even full rifles. The Modular Lock, or M-LOK, system ditches the keyhole shape in favor of slots and benefits from attachment lugs on accessories that are t-shaped and bi-directional. This design allows M-LOK compatible accessories to mount at the front or rear of the slots. The slot-like design originated in 2007 on the Masada Concept Rifle, which featured a polymer handguard with three vent holes acting as negative space for accessory mounting. Continuing mounting innovation into 2009, the company released MOE handguards, bringing the same slot system to mainstream consumers. In 2014, Magpul upgraded the MOE style, debuting M-LOK which offered a similar look and feel to MOE, but with larger, durable, squared-sided slots. Magpul chose not to open-source its creation, opting for free licensing instead. Free licensing allows other gear manufacturers to create M-LOK guards and accessories, so long as the makers receive approval from Magpul. Magpul says the free licensing decision was enforced to retain consistency and quality across the platform. Since its inception, Magpul’s M-LOK system gained in popularity, inching ahead of KeyMod. Jerking the Trigger reported that M-LOK sales pulled ahead of KeyMod in 2016, with several distributors and manufacturers selling M-LOK over KeyMod at a rate of around 3 to 1. M-LOK received even more buzz this year when U.S. Special Operations Command weighed in on the mounting debate, selecting M-LOK as the superior system. The decision was the result of a study conducted in 2016 by the Naval Surface Warfare Center, Crane Division, at the behest of SOCOM. Testing three KeyMod and three M-LOK handguards by Aero Precision, Midwest Industries and Seekins, Crane concluded that M-LOK was the more durable design. Keymod remained on par with M-LOK during endurance and rough handling experiments, however dropped the ball, so to speak, during drop testing. M-LOK accessories remained attached 100 percent during 5-foot drop onto a steel plate. In contrast, only 33 percent of KeyMod accessories remained on-board. In addition, M-LOK achieved a 73 percent improvement in average Point of Aim shift over KeyMod. Though Crane noted that Magpul’s results were favorable, the testing site did acknowledge that KeyMod self-aligns much better than M-LOK and requires less attention while mounting. Magpul’s Liptak said the results of the SOCOM tests further proved why M-LOK fans prefer it over the competition. Has video killed the radio star? Will M-LOK relegate KeyMod to the archives? At the moment, it seems KeyMod hasn’t given up the fight. Despite M-LOK’s commercial and military success, distributors still stock KeyMod and aren’t rushing to pull the keyholed design off the shelf. As in every facet of gun consumerism, there will be holdouts dedicated to the KeyMod platform.